The Yamaha FZ09 stands in direct contrast to the competition, bringing ground up design, reliable performance in an unmatched price range. Powering the FZ09 is a new 847cc triple, featuring a crossplane crank design that provides consistent power through the entire rev range. The compact engine provides 115 horsepower and 65 ft-lb torque allowing the FZ09 to pull hard at any rpm from standstill to redline. With a commuting rider in mind, Yamaha has designed the FZ09 with a very narrow chassis, allowing you to navigate heavy traffic with ease and comfort. Yamaha’s specific control-fill aluminum chassis is not just about comfort however, the combined short wheelbase, narrow engine, and low weight make the FZ09 a perfect choice for anything from city commutes to canyon carving. Adjustable KYB suspension allows you to custom set your rebound preferences all conditions whether it be pothole-ridden city riding, or hard cornering on your favorite back road. Riding position on the FZ09 has been redesigned from the former FZ8, with higher bars and lower footpegs, putting you in a more upright, yet still forward orientated position. This allows for increased comfort over daily riding, with plenty of room for aggressive positioning when you find yourself with some open road. The narrow chassis design, and upright riding position means that riders won’t have to sacrifice daily comfort for the larger engine upgrade. 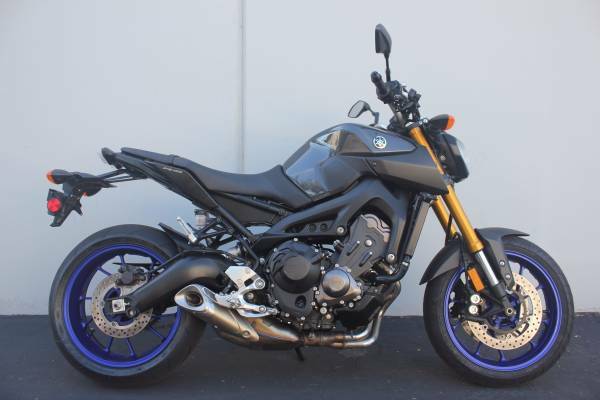 The FZ09 is an ideal choice for riders seeking increased power output from a 600cc standard and naked class motorcycle without breaking the bank. Suspension: 41mm front forks up front, monoshock rear suspension with adjustable preload. Brakes: Dual 298mm discs with hydraulic calipers in front with a single 245mm disc with hydraulic caliper at the back.